Fifty years ago this week, Sir William Lyons announced his magnum opus. On the 26th September 1968, amid the opulence of the Royal Lancaster Hotel on London’s Bayswater Road, Sir William Lyons revealed Jaguar’s long-awaited saloon. Neither a particularly confident nor enthusiastic public speaker, the intensely private Jaguar Chairman was persuaded to record his introductory speech to the assembled dealers, dignitaries and members of the press, as the still secret new XJ6 was revealed over four successive nights. The lavish series of functions climaxed with Guests being directed to a darkened function room where Sir William, picked out by spotlights, announced, “ladies and Gentlemen, I should like to introduce to you my new car.” The lights would then gradually brighten to reveal a single XJ6 on a raised turntable, surrounded by nine further examples arranged around the room’s perimeter. The reception throughout was rapturous, with dealers and motoring press alike lining up to congratulate Lyons on pulling off perhaps his greatest masterstroke yet. What few realised however was Sir William’s utter mystification that nobody had commented upon the hasty adoption of the 4.2 litre engine, nor the fact that at the time these ten examples represented about a fifth of XJs in showable condition anywhere, such were the difficulties Jaguar faced in getting the car into full-scale production. A first for both Jaguar and Lyons was his appearance in a press advertisement endorsing the new car. Sir William was reportedly reluctant to put himself forward, but it was nonetheless a powerful message of confidence, one borne out by the lavish and strikingly art-directed sales material for the model, both of which were overseen by Jaguar’s PR-chief, Bob Berry and executed by their retained ad-agency, Nelson Advertising. XJ6’s body style might have reflected a harmonious evolution of Jaguar aesthetics, but so too did its cabin. The dashboard, while similar in overall appearance to that of the Mark Ten, was more logically laid out. Two main instruments faced the driver, set into the padded walnut veneer dash panel, while five auxiliary gauges sat centrally, with a neat row of rocker switches grouped below. What set the XJ6’s cabin apart was not only its generous width, but the huge expanse of the centre console, which lent the interior something of an aircraft ambience, one more akin to that of an E-Type. Specially designed seats (by Slumberland) located driver and passengers far more comfortably and securely than of yore. The XJ’s cabin then, was warm, inviting, richly appointed, yet tastefully spare. The entry level XJ6 was offered with a 2792 cc version of the XK in line engine, essentially a short-stroke version of the existing 4.2 litre unit. In fact both engines shared an identical cylinder head. With about 140 bhp (Net) at 6000 rpm and 182 lbs ft of torque, the small-capacity XJ was a good deal smoother and more free-spinning than its larger brother. A reasonable performer too, but only if Jaguar’s four-speed manual/overdrive transmission was fitted. The slower-revving and compromised 4.2 produced slightly about 180 bhp (Net) at 5500 rpm and a hefty 283 lbs ft of torque, which proved a better match to the Borg Warner Model 8 automatic transmission. An improved cooling system was incorporated to address one of the 4.2’s Achilles heels, a marked propensity to overheat when driven hard, a consequence of the XK engine having reached the limits of development. It was some months before the mainstream UK auto press got their hands on an XJ6, but when they did, the accolades swiftly followed. Motor tested a manual 4.2 model, stating that it “came closer to perfection than any car we have yet tested, regardless of price”. Rival weekly, Autocar soon followed, stating their automatic test car was “unmatched by anything in the saloon class”, stating that its handling bettered that of the E-Type. Meanwhile Car magazine awarded it their Car of the Year accolade for 1969, with acerbic critic, LJK Setright asserting that the XJ6 “makes superfluous all other cars costing more”. To further bolster Browns Lane’s trophy cabinet, the Jaguar also won that year’s Don safety award. In sotto-voce briefings to journalists, Jaguar hinted that ‘multi-cylinder’ versions of the car would soon become available – a 3565 cc 60° V8 intended to supplant the ‘interim’ 4.2 six, while a closely related 5343 cc V12 would cap the range. It seemed that Jaguar, after a period of uncertainty had finally regained its swagger and appeared once more to be on the cusp of greatness. The XJ6 had rewritten the luxury saloon car rulebook – its combination of style, elegance, fine performance, luxurious appointments, supremely capable dynamics, coupled with unrivalled ride comfort and NVH isolation, meant that Jaguar, mere minnows in global terms had contrived to produce a World-beating product. It was a striking vindication of Lyons’ vision and his engineering team’s technical prowess. There was only one problem, and it was a big one. This being Jaguar’s habitual bête noir – building them. That´s a very fine brochure. It reminds me of the lovely ones Citroen did in the 1970s. The graininess and rich colour is artificial but not distracting – more like style than technical intrusion. Back in the days of these cars when they first appeared I was fortunate to experience progressing from a Mk ll both six and Daimler V8 version through a 4.2 Sovereign and then finally an XJ with the 2.8. There were big improvements with each model but the XJ series was far ahead of the older cars in the ride and drive department. I too remember the older cars ran crossply tyres which would’nt have helped the drivability whereby the XJ had radials plus the more accurate rack and pinion steering. The twin tanks were a “PITA ” to fill and because the petrol gauge read each independently it therefore dropped rather quickly and you had to remember that days ago one tank had been used and was no longer a reserve otherwise panic. It’s always amusing when people start an XJ-related chat at the petrol station and sooner or later come to the topic of the twin tanks. Particularly in the 5.3’s case, most appear to believe that the Jaguar’s fuel tank capacity is twice as large as a ‘regular’ cars (which it is, but not compared to any direct competitor). 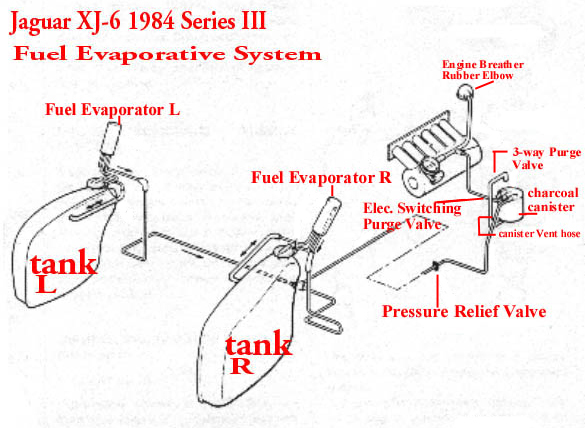 I understand the idea of the twin tanks, where each was neatly accommodated in one of the rear wings, but couldn’t the twin tanks have been connected by a pipe close to the bottom of each, to prevent this problem? It it was large enough diameter to cope with the volume of petrol from a pump, then they could have dispensed with one of the filler caps. If this was unfeasible, then even a small diameter connecting pipe would have kept the fuel levels in each equalised, preventing the “no reserve” problem and simplifying the fuel gauge measurement. Daniel, I can only speculate here, but from my reckoning the issue was probably one of packaging. The integrated Jaguar IRS within its hefty metal subframe (cage) is a bulky device and as I point out in the text, wasn’t intended for the car in the first place. Packaging was already a bit of a nightmare for Jaguar’s engineers – the XJ4 bodyshell being particularly low-slung, so it’s conceivable that a solution such as you outline was simply impossible to accommodate, given the strictures placed upon them. Regarding tyres, Jaguar had tested extensively with radials on their existing production cars during the early 1960s, using all of the leading suppliers. Each had their plusses and drawbacks, but Bob Knight simply wouldn’t countenance them until he was satisfied they met his exacting NVH standards. In the event, he was over-ruled by his boss, Bill Heynes and Dunlop radials were made available as a cost-option on most Jaguars from around 1963. (Albeit with a written fact-sheet laying out all of the potential issues of noise and inferior ride quality). You’re not missing anything; I did precisely that, ditching two huge, heavy SU pumps (that looked as though sourced from Army surplus) for one solid state American pump about a fiftieth of the size and weight on my S1 V12. But that was when the car was at least 12 years old, so probable not something available at launch. One additional advantage; flipping the tank switch to the now unused second feed = cheap anti-theft device. This reminds me of the dictum that while the Germans are good at avoiding problems, the British are good at fixing them. That´s a very entertaining fix and much more entertaining than a boring single tank. It’s a fascinating read and whilst I have admired Jaguar s only from afar, I do feel a sense of pride at them still being around after so much turmoil.